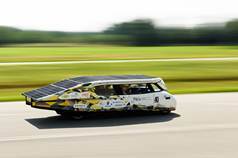 Ericsson (NASDAQ:ERIC, news, filings) is supporting Solar Team Eindhoven in the World Solar Challenge with an in-built application based on the Ericsson Connected Traffic Cloud. The application, called Solar Navigator, brings economic driving to the next level. By collecting current weather data and traffic data, Solar Navigator gives suggestions for the optimal route, which will facilitate better decisions regarding the speed of the car during the race and the charging level of the batteries.